Members of local NAACP chapters protested outside City Hall Monday afternoon as the Chicago officer charged with the fatal shooting of Laquan McDonald made another court appearance, where he received $1.5 million bond. Several people marched carrying coffins and chanted "What do we want? Justice! When do we want it? Now!" and "Stop the cover-up! Sixteen shots!" in reference to the number of times McDonald was shot by Officer Jason Van Dyke. The purpose of the demonstration was to push for reform in the police department, according to NAACP officials. During a press conference held during the demonstration, several NAACP members spoke about police reform and reiterated their demand for a formal investigation of the Chicago Police Department. They also asked for the resignations of Mayor Rahm Emanuel and Cook County State's Attorney Anita Alvarez. "We are here because we are, as a city, as a citizenry, as a nation, grieving the death, the senseless, tragic death, of Laquan McDonald," said Cornell Brooks, president and CEO of the NAACP. "We have before us a casket. Caskets carry the loved ones that we've lost to death, sometimes as a consequence of disease, illness, old age, but not one of us can imagine the heartbreak of losing a loved one to police misconduct. And we're not merely here to grieve the loss of a 17-year-old. 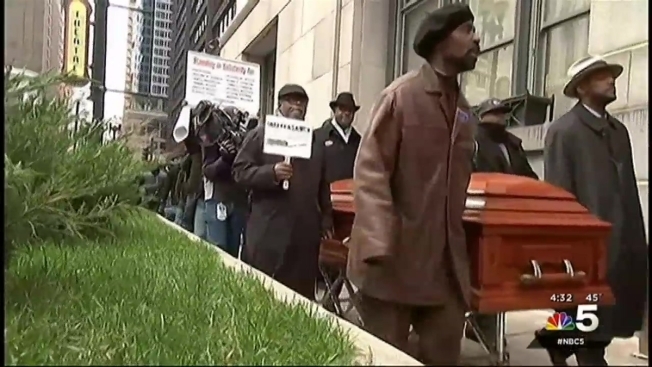 We're here before this emblem of death, this casket, to bury police misconduct in the city of Chicago." Members of the NAACP South Side and West Side chapters held a press conference last week announcing the protest and asking for a formal investigation into Chicago's Independent Police Review Authority following the release of the dash-cam video showing the fatal shooting of 17-year-old McDonald. After McDonald was shot by Van Dyke in October 2014, the shooting incident was first investigated by IPRA, which investigates all police-involved shootings. Last Tuesday, more than a year after the shooting, Van Dyke was charged with first-degree murder. Later the same day, the dash-cam video was released to the public. Rose Joshua, president of NAACP South Side Chicago chapter, decried the relation between IPRA and the Chicago Police Department and said the "marriage" between the two organizations leads to skewed data that favors police officers over victims. Joshua said the NAACP chapters on the South and West Sides plan to file a complaint with the Department of Justice concerning IPRA and the information it shares with the police department.